The Jeep Cherokee Grand is a large, comfortable, and popular full-size SUV. The Jeep Grand Cherokee is proud to bring many sports car-like features to the table, and these features include plenty of pep under the hood and exceptional handling. 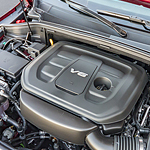 Jeep Grand Cherokees come fully equipped with 8-cylinder engines that feature over 6.2L of displacement. These numbers allow this vehicle to develop well over 700hp and similarly high torque values. This kind of power allows the Jeep Grand Cherokee to complete quarter mile runs in less than 12-seconds. The Jeep Grand Cherokee is also well tuned in terms of displaying this power. This iconic vehicle includes preset driving ranges that take the guesswork out of gear selection. These ranges include Snow and Go, Track, Sports, and Auto. It also includes a proprietary Standard Launch Control technology that optimizes transmission, engine, and other systems to provide a race car-like take off.